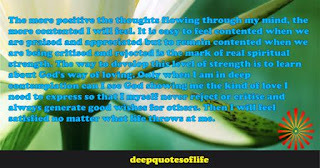 The more positive the thoughts flowing through my mind, the more contented I will feel. It is easy to feel contented when we are praised and appreciated but to remain contented when we are being criticized and rejected is the mark of real spiritual strength. The way to develop this level of strength is to learn about God's way of loving. Only when I am in deep contemplation can I see God showing me the kind of love I need to express so that I myself never reject or criticize and always generate good wishes for others. Then I will feel satisfied no matter what life throws at me.